Today we plan to arrive at Fortaleza, the capital of the Brazilian state of Ceará. After arrival we will drive 120km south to the mountain range of Serra de Baturite (800m) for a night stay. Night at Guaramiranga. This morning will be spent exploring the forests of the Serra de Baturite. This low lying mountain range contains habitats such as moist, humid, semi-deciduous and dry forests, and host many sought-after species. Our targets here include the difficult Grey-breasted Parakeet, plus Ochraceous Piculet, Ceara Gnateater, Gould’s Toucanet and the rather pretty Buff-breasted Tody-Tyrant, with the last four all possible in the forest surrounding our ideally positioned hotel. If we are lucky we may come across the rare Moustached Woodcreeper, the local form of Spot-winged Wood-Quail (a potential split), Rufous-breasted (Ceara) Leaftosser, Guianean Tyrannulet, Lesser (Northern) Woodcreeper, and a very interesting population of Short-tailed Antthrush with unusual vocalisations. This tiny isolated range with its many interesting species and a good selection of endemics from Eastern Brazil will also have us look for Gould's Toucanet, Wing-banded Hornero, Grey-headed Spinetail, the north-eastern race of Blond-crested Woodpecker, Little Woodpecker and Band-tailed Manakin. Among the commoner forest species we should see Squirrel Cuckoo, Straight-billed and Lesser Woodcreepers, Sooty-fronted and Ochre-cheeked Spinetails, White-throated Spadebill, Black-tailed Flycatcher, Planalto and Reddish Hermits, Ruby-topaz Hummingbird and Pectoral Sparrow. We will also encounter a selection of open country species such as Turkey and Lesser Yellow-headed Vultures, Snail Kite, Savanna Hawk, Wattled Jacana, Southern Lapwing, Masked Water-Tyrant and Red-necked Tanager. From here we will make our way to Quixada, stopping at wetlands where we may see three species of whistling-duck plus Southern Pochard, Least Grebe and possibly White-throated Seedeater and Pale Baywing. Our delightful establishment is perched on a rocky escarpment with views over the surrounding caatinga. Night at Quixada. Our morning around Quixada will hopefully connect us with a few caatinga species such as the very localised and rare White-browed Guan, which is often seen near the hotel. We also have chances for other species such as Pygmy Nightjar, Cactus Parakeet, Ochraceous Piculet, Ochre-backed Woodpecker, Broad-tipped Hermit, Black-bellied Antwren, White-naped Jay, Sooty-fronted Spinetail and Pearly-vented Tody-Tyrant. As we leave this area of dry and thickly wooded landscapes we will make several stops to acquaint ourselves with some of the commoner species. We should see the recently split Caatinga Cacholote at its huge stick nest and find the stunning north-eastern form of Capped Seedeater, plus Caatinga Antwren , Rufous-tailed Jacamar, Olivaceous Woodcreeper, Mouse-coloured Tyrannulet and many others. The isolated plateau of Chapada do Araripe is surrounded by massive red and grey cliffs and it is here amongst the lush growth at the base of this escarpment that we will look for outstandingly beautiful and critically endangered Araripe Manakin. This species was only discovered very recently and we stand a very good chance of seeing it. The males pearly white body with jet black wings and bright red head make a striking impression amongst the greenery of the forest. The rest of our time will be taken up in search of many regional endemics and in these stunning dry forests we will look for the elusive White-browed Antpitta and the striking White-browed Guan, while one of the real prizes in these woodlands is the Great Xenops which can often be found chiselling away at loose bark in search of food. We will also search out Tawny Piculet, Pale-bellied Tyrant-Manakin, Caatinga Antshrike, Red-shouldered Spinetail, Grey-eyed Greenlet and hopefully come across a marauding flock of beautiful White-naped Jays. Others species that will hopefully put in an appearance include Caatinga Antwen, Tawny Piculet, Black-capped Antwren, Stripe-backed Antbird, Long-billed Wren, Glittering-throated and Glittering-bellied Emeralds, Blue-crowned Trogon, Bearded Bellbird, Flavescent Warbler and a good selection of the more widespread South American flycatchers such as Forest and Grey Elaenias, Sepia-capped, Grey-crowned, Fuscous, Swainson’s and Short-crested. Finishing off with the endemic Ash-throated Casiornis we should have done this wonderful area justice. Nights in Juazeiro do Norte. After some early morning birding in the Serra do Araripe area we will drive across cattle country with its numerous wetlands. We should see Cattle and Snowy Egrets, Purple and Spot-flanked Gallinules, Limpkin, Black-bellied Whistling-Duck, Brazilian Teal and if we are lucky, Southern Pochard. Other common birds should include Guira Cuckoo, White-winged Swallow, Cattle Tyrant, and both White-browed and Chopi Blackbirds. Crossing the Sao Fransisco River we head south-east to the small town of Canudos in the heart of the Caatinga. On our travels through this extraordinary habitat we will pass numerous short and tall cacti in search of Caatinga Parakeet, Silvery-cheeked Antshrike, Scarlet-throated Tanager, Red-legged Seriema, Pectoral Antwren, Broad-tipped Hermit and White-bellied Nothura, as well as the unique Red-shouldered Spinetail - a distinctive species put into a genus of its own. Accompanying these species will be the Caatinga Cacholote, Black-bellied Antwren, Aplomado Falcon, Dark-billed Cuckoo, Blue-winged Parrotlet, Spot-backed Puffbird, Tawny-crowned Pygmy-Tyrant and White Monjita. Further along the road in this impenetrable thorny scrub we will search out the endemic White-throated Seedeater and the Campo Oriole (split from Troupial). We should also hear the dawn whistles of Small-billed Tinamou and see Stripe-backed Antbird, Lesser and Greater Wagtail-Tyrants - both of which represent isolated populations in this area and so potential splits, White-naped Xenopsaris, Caatinga Barred Antshrike, Pileated Finch, Ultramarine Grosbeak, Southern Scrub Flycatcher and the abundant Bay-winged Cowbird. Night at Lear's Macaw Lodge. Leaving Canudos we head across endless rolling country, red-rock escarpments and cactus studded Caatinga for the Rasa da Catarina, home to the very rare and endangered Lear’s Macaw. 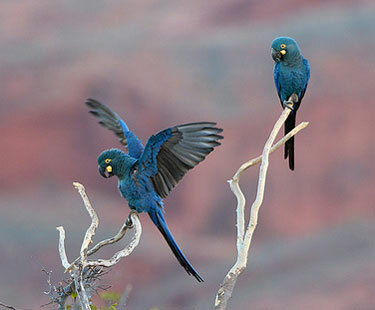 It is here that the Lear’s Macaw has managed to survive, nesting in crevices in the rugged canyon walls. One of the rarest birds in the world about 250 mature individuals remain in this area rediscovered by Helmut Sick, the famous Brazilian ornithologist. These birds will be an important target for us this morning and with luck we may even find this rare species feeding in the local Licuri palms. This stunning landscape will give us more chances for species such as the highly threatened Pectoral Antwren, Tataupa Tinamou, Broad-tipped Hermit, Stripe-breasted Starthroat, Swallow-tailed Hummingbird, Pearly-vented Tody-Tyrant, Turquoise-fronted Parrot, Harris’ and Savanna Hawks, Aplomado Falcon, Burrowing Owl and Ferruginous Pygmy-Owl. Amongst the other open country species we could see are Cattle Tyrant, Fork-tailed Flycatcher, Guira Cuckoo, Pearl Kite, Yellow-headed Caracara, Chopi Blackbird, Red-cowled Cardinal, White-winged Becard and Green-barred Woodpecker. With luck we could come across the extraordinary Scarlet-throated Tanager, this intriguing species is currently classified as a tanager but is certainly more reminiscent of an icterid. Continuing on our long drive we may get the chance to stop at ponds where both Masked Duck and Spotted Rail are present. Night at Lencois. The Serra de Diamantina comprises a mixed landscape of grasslands, cerrado scrub and deciduous woodlands with rocky outcrops and tall sandstone cliffs. The area was named after the diamond mining that occurred here, but the only precious gem we are likely to find and one of our main targets is the simply fantastic looking Hooded Visorbearer, a hummingbird at the top of its class! This huge park with a landscape composed of a mosaic of Campo Sucio and Cerrado will offer us many more tantalising species such as South American Snipe, Grey-backed Tachuri, Buff-throated Pampa-Finch, Collared Crescentchest, White-eared Puffbird, Plain-crested and Highland Elaenias, Broad-tipped Hermit, Horned Sungem, White-vented Violetear, Violet-capped Woodnymph, Versicoloured Emerald, Spotted Piculet, White-eared Puffbird, Grey-backed Tachuri, Chicli Spinetail, Rufous-sided Pygmy-Tyrant, White-banded and Cinnamon Tanagers, Rufous-winged Antshrike, Pale-throated Sierra-Finch, Yellow-billed Blue-Finch and many others. Yellow-legged Tinamous can be heard calling from the dense undergrowth and will take a bit of finding while special birds such as Spotted Piculet, Diamantina Tapaculo and with luck Golden-capped Parakeet may be encountered. Patrolling raptors should include King Vulture and Black-chested Buzzard-Eagle, and we will look for flocks of Biscutate Swifts wheeling around, noisy Speckled Chachalacas, Scaly-headed Parrots, Surucua Trogon, Crimson-crested Woodpecker, Streaked Xenops, White-shouldered Fire-eye, Collared Crescentchest, Yellow Tyrannulet, Greenish Elaenia, Eastern Sirystes, Black-tailed Tityra, Hooded Siskin and Green-winged Saltator. We also have another chance to see Great Xenops again at another known site for this species and possibilities for two recently described species, the Sincora Antwren and São Francisco Sparrow. Night at Chapada Diamantina. This morning we set off on the long drive (500kms) to Boa Nova for a two-night stay. In this famous area we will divide our time between two habitats; the drier Mata de Cipo or vine forest and the lusher fragments of Atlantic rainforest. It is in the Mata de Cipo that we shall search for the rarer endemic species and this transitional habitat sits between the arid Caatinga proper and the wet Atlantic rainforest. It is characterised by a profusion of terrestrial bromeliads and thick vine tangles covering a rather open low-canopied forest. It is in this strange forest that we look for Slender Antbird and Narrow-billed Antwren along with the more widespread Stripe-backed Antbird, Silvery-cheeked Antshrike and Buff-breasted Tody-Tyrant. We will also visit an area for the recently described Diamantina Tapaculo, and as we move further east towards the wetter habitats we shall be looking for species more closely associated with south-east Brazil such as Grey-hooded Attila, Frilled Coquette, Buff-throated Purpletuft, Crescent-chested Puffbird Yellow-eared Woodpecker, Pallid Spinetail, Striated Softtail, White-collared Foliage-gleaner, Yellow-lored Tody-Flycatcher, Oustalet's Tyrannulet, Gilt-edged Tanager, Reddish-bellied Parakeet, Scale-throated Hermit, Sapphire-spangled Emerald, Black-eared Fairy, Black-throated Trogon, Swallow-wing, Black-necked Aracari, the red-throated race of Yellow-throated Woodpecker, Plain-winged, White-throated, Planalto and Scaled Woodcreepers, Black-billed Scythebill, Ochre-breasted and Buff-fronted Foliage-gleaners, Sharp-tailed Streamcreeper, Sharpbill, Swallow-tailed Manakin, Hang-nest Tody-Tyrant, Greenish Mourner, Chestnut-crowned Becard, White-necked and Cocoa Thrushes, White-browed Warbler, Red-crowned Ant-Tanager, and both Black-goggled and Golden-chevroned Tanagers. An area of marshland could produce Giant Snipe, as well as Rufous-sided Crake and Blackish Rail, and nearby areas hold Campo Flicker, Pale-legged Hornero, Yellow-browed Tyrant, Brown-chested Martin, White-bellied Seedeater and maybe Least Pygmy-Owl. We will also visit other nearby areas for the range restricted Bahia and Pallid Spinetails, Ferruginous Antbird, Striated Softtail, Rio de Janeiro Antbird, Fork-tailed Tody-Tyrant, Pin-tailed Manakin, Gilt-edged Tanager and Mantled Hawk. Nights in Boa Nova. This morning we will drive some 40kms to Pocoes where the main target will be the mega-rare Wied's Tyrant-Manakin, a species only recently discovered. Today will also give us further chances of any species we might have missed at Boa Nova and we may well return to Boa Nova for lunch and then spend the rest of the afternoon in the nearby Atlantic rainforest. Night in Boa Nova again. Serra Bonita harbours one of the last good remnants of moist submontane forest in the region. This mountain range has a unique habitat, with an important altitudinal gradient of native Atlantic Forest between (200–950 m). An extraordinary conservation effort is being conducted by the owners who have created a private reserve and built an excellent lodge and a research centre. Birds are everywhere! Of course the main target is the unique Pink-legged Graveteiro, which was only discovered in 1996 and always nests close to the lodge. Birding the access road between the lodge and the junction to the cell tower can produce Plumbeous and Spot-breasted Antvireos, Salvadori’s and Star-throated Antwrens, Spot-backed Antshrike, White-eyed Foliage-Gleaner, Crescent-chested Puffbird, Lemon-chested Greenlet and many others. There will be chances to see Bahia Tyrannulet and Rufous-brown Solitaire, and we will always keep an eye on the sky as a good assemblage of raptors inhabits the area including Black Hawk-Eagle, Black-and-white Hawk-Eagle, Mantled Hawk and King Vulture. When bamboo is seeding Buffy-fronted Seedeater, Temminck’s Seedeater and Sooty Grassquit are very common (and noisy! ), and we could see Drab-breasted Bamboo-Tyrant and White-wedged Piculet. In the late afternoon we will visit the Research Station to enjoy ‘Serra Bonita’s Caipirinha’ while watching tanagers, hummingbirds and other species come to the feeders, including Spot-billed Toucanet, Green-headed, Red-necked, Brazilian and Azure-shouldered Tanagers, Green Honeycreeper, Maroon-bellied Parakeet, Sombre Hummingbird, Brazilian Ruby, Scale-throated Hermit and Black Jacobin just to mention a few. Nearby we could encounter Golden-capped, Plain, Maroon-faced and Blue-throated Parakeets, Buff-bellied Puffbird and Eastern Striped Manakin. There are also possibilities for Weid's Black-tufted-ear Marmoset and Tayra. Nights at Serra Bonita Private Reserve. This morning we will drive to Porto Seguro for a two night stay where we will make several visits to the superb Veracel and Rio do Brasil Reserves - privately owned reserves that protects more than 6,000 ha of pristine lowland Atlantic Forest. There are several good birds to be seen here but undoubtedly the star attraction is the stunning Banded Cotinga, a very rare and difficult species to find, which is now confined to just a few forests in eastern Brazil & we will make a concerted effort to try and locate this gorgeous bird. Natural clearings of white sandy soil and low vegetation known locally as “mussununga” are the best places to look for the cotinga atop the tallest trees. Apart from the cotinga there are plenty of rare and endemic species around, including White-winged Potoo, Red-browed Parrot, Blue-throated and Ochre-marked Parakeets, Hook-billed Hermit, the beautiful White-winged Cotinga, Bare-throated Bellbird, Black-headed Berryeater, Golden-tailed Parrotlet, Reichenow’s Blue-headed Parrot, Band-tailed and Bahia Antwrens, Little and Variegated Tinamous, Black-necked Aracari, Rusty-margined Guan, Rufous-thighed and Double-toothed Kites, White-necked Hawk, Red-stained and Ringed Woodpeckers, the local race of Swallow-wing, Cinereous Mourner, Screaming Piha, Hook-billed Hermit, Racket-tailed Coquette, Rufous-throated and White-chinned Sapphires, Swallow-tailed Hummingbird, Bahia Antwren, the vulnerable Band-tailed Antwren, Rufous-winged Antwren, Sooretama Slaty and Chestnut-backed Antshrikes, Crested Becard, Thrush-like Schiffornis, Pin-tailed Manakin, White-bellied and Silver-breasted (Opal-rumped) Tanagers, Yellow-lored Tody-Flycatcher, White-lored Tyrannulet, Eared Pygmy-Tyrant, Red-rumped Cacique, Yellow-green Grosbeak and much more. Nights at Porto Seguro. Depending on our flight times today, we may have some time to visit the nearby mangroves in search of the endemic Little Woodrail, as well as Mangrove Rail, Bicolored Conebill and Plain-bellied Emerald. Later we will transfer to Porto Seguro airport for our international departure. 2019 Tour Report Coming Soon!